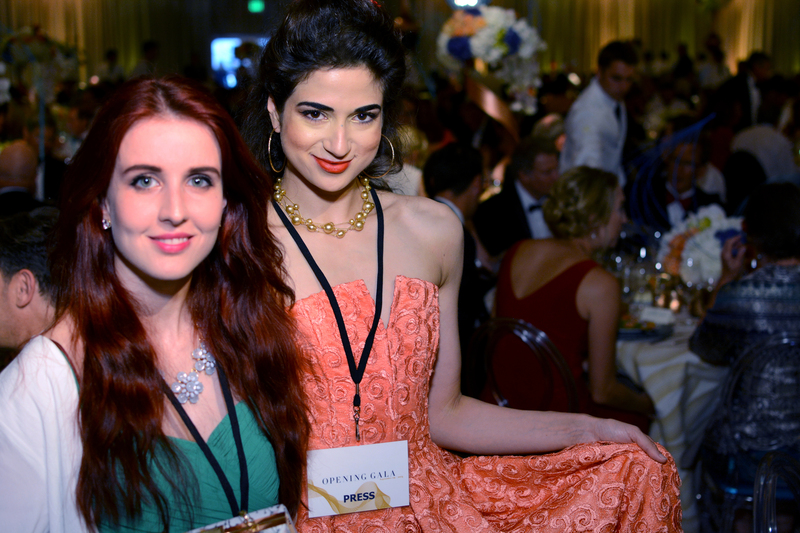 We joined a flurry of gorgeously decked out fans, patrons, and fashionistas to welcome the SF Symphony into its 104th Season at the recent opening-night Gala – the Symphony’s single largest fundraiser for its free music-education programs. Opulent flower arrangements adorning the cinderella-esque staircase designed by Blueprint Studios greeted us as we arrived at City Hall for the Symphonix cocktail hour. We chatted with Symphonix Co-Chairs Clarissa Nicosia and Brianna Haag – who both wore stunning, one-of-a-kind gowns they helped create with local designer Karen Caldwell. These two women are leaders integrating the movers and shakers of the young tech culture with a strong involvement in the Symphony and the arts of San Francisco, building a community of cultural appreciation for a younger generation. Across the street at Davies Symphoy Hall, the Patrons Dinner Tent was decorated by rococo decor designed by Blueprint Studios and inspired by Botticelli’s “Birth of Venus” painting. The fabulous, exuberant designer Karen Caldwell shone like Venus herself in one of her own designs – glowing in a golden gown that reflected the Bottecelli interior perfectly – and engaged us in a great fashion discussion about creating the gowns for the 6 women she dressed for the evening. Komal Shah was as lovely as ever, reminding us of the Swan Queen in her custom made Christian Siriano white pearl and feather gown – but it was her warm inner beauty and confidence that shone through most vividly. The SFS performance began with Respighi’s “Roman Festivals” (sounds of gladiators and jubilees) and paired perfectly with the Valentino post-party sponsorship of the evening. Our favorite Valentino look was worn by Symphony President Sako Fisher – who looked magical in an ethereal Valentino pre-fall galaxy tulle skirt. We ended up dancing the night away at the festive indoor/outdoor after-parties on Grove Street and delighting in delicious mini-lamb burgers and local ahi-tuna poke to keep our energy high! We loved experiencing the the celebration of music and cultural emphasis such an entrepreneurial city has to offer, especially with the innovative and intellectually brilliant MTT leading the way.